He is the coolest cat there is… well, other than Boris! I flew into in Sydney late yesterday, and stayed in a hotel at Olympic Park, en route to Kiama for the next three days, and wait for it… a hotel with no room service, no dinner and no breakfast. Garfield would not like it here one little bit!!! The lights are on, but no-one is home inside my head, not even bright enough to find a joke, so this is my rather feeble attempt at a Tuesday blog this week. 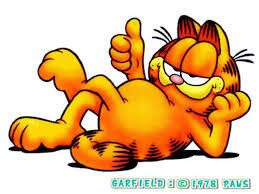 Garfield comic books were once one of my favourites, along with Footrot Flats, but one of my house mates stole my whole collection when I was about 25 years old. They were not given to her to borrow, she simply took them when she left, along with half my household goods. I’ve never got around to replacing those comic books, but do still love Garfield. It must be that age when we are sharing flats and houses when these things happen… my youngest son has just had the same experience after one of his housemates left to live in another state. Such is life… it is after all, only stuff. Cats, dogs… and unconditional love.